On his working relationship with designer Simi, Leone was to recall, the decors are built with scrupulous attention to detail and authenticity, some taken from this place, some from that. I use many, many photographs of the period. I do very careful research which even amazes my American friends, such as Spielberg & Scorsese. When they came to Rome, they were astonished by the number of photographs, by this complete visual documentation which starts out from the small detail to arrive at the total effect... all these interiors and scenes represent an incredible amount of work on our part, almost impossible to do again. Regards the never filmed flight to Detroit scene - Screenwriter Stuart Kaminsky recalled as “probably the funniest scene (from the original script) involved the gang in the 1930’s on the flight - the gang members have smuggled gin onto the plane & proceed to have a party; the other passengers at first show their disapproval but conclude with joining in the merriment. On the page, the scene has a rousing, populist,Capraesque quality. Many thanks for the link. First time I've seen this in 720. Thanks for posting! Very interesting, as I have never seen this interview before. For the first time I think we have the exact length of the movie, since Sergio talks about that from 15:04 to 17:16. In essence, he says that the full version of the movie is 4 hours and 30 minutes, but this very long version is meant just for the TVs which will be allowed to air it in about 3 years after the premiere in the theaters. He stresses that the length of the movie he wanted (in his words: "my official version and the version for the whole world") for the cinema is 3 hours and 40 minutes and that this is the only version he will recognize as his own work. He knows already during this interview (autumn 1984) that most probably the USA version would be chopped and changed and he very clearly states that any attempt to do so would mean that he will not want to be recognized as the author of this chopped movie. Thanks for posting! Very interesting, as I have never seen this interview before. For the first time I think we have the exact length of the movie, since Sergio talks about that from 15:04 to 17:16. In essence, he says that the full version of the movie is 4 hours and 30 minutes, but this very long version is meant just for the TVs which will be allowed to air it in about 3 years after the premiere in the theaters. order. Around the same time The BBC turned down the chance to show the film in the UK because of the length & violence - they had previously run into trouble with the Deer Hunter having to dub the swearing because of the watershed - Ch4 had the same problem with Raging Bull. When SKY Movies (now Sky Cinema) launched in the UK in 1989 OUATIA (uncut) was never off the air - showing multiple times on a weekly basis for at least a year - it was where a lot of people in the UK discovered this film. The conversation with Carlo Simi in the beginning is funny, since Leone keeps saying "I want this", "It has to be exactly like this..", "this is a must" (referring to the 1929 Boeing, which he tells Simi is owned by Howard Hughes), "look at this orchestra, this must be reproduced exactly like this!" and Carlo Simi keeps saying "OK, no problem, can be done.." and in the end, Leone tells him "Well, good work now" and Simi "Thanks a lot!" The nine minutes has been discussed before. 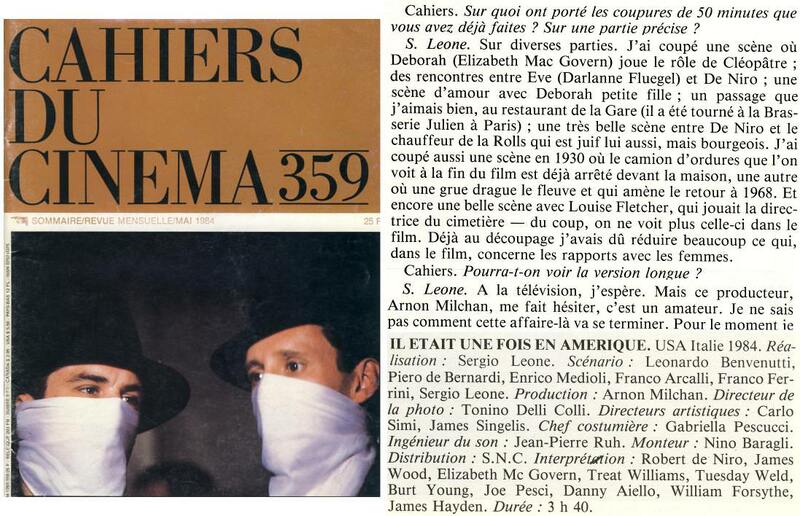 Immediately after the movie was shown at Cannes in 1984, Leone did an interview with Cahiers du Cinema and this interview was featured in their magazine no 359 dated May 1984. Leone: It's a complicated story. They gave me carte blanche to do four and a half hours (270 minutes) with the idea that it would be made in two parts, that is to say two films coming out together. But four months after the start of editing, they said to me no, it is not possible, because in the U.S. (that's what they told me, I do not know if it is the truth), a sequel cannot come out less than three months after the first part, for competitive reasons, because operators are not necessarily the same for both parts. If it were possible for both parts to be released simultaneously, it would result in unfair competition from operators who have a single theater. It therefore seems that some operators cannot handle a double distribution. They demanded that I cut the film. I did not want to go back to the first concept which was three hours. I cut as much as I could, and I arrived at the 3hours 40min (220 minutes) version which you have seen. But then they wanted me to cut a further hour, especially in the beginning. The only possibility would be to remove the flashback construction, and I did not want that. We'll see. I have retained a very good French lawyer, Leo Matarasso (the lawyer of Orson Welles), because the contract was made in France under the Napoleonic Code. I also have a lawyer in the U.S. to try to stop distribution in a truncated version. But my first course of action must be against the producer, who is in France. Cahiers: Have the 50 minutes of cuts been focused on a specific part? Leone: On various parts. I cut a scene where Deborah (Elizabeth McGovern) plays the role of Cleopatra; meetings between Eve (Darlanne Fluegel) and De Niro; a love scene with Deborah as a young girl; a passage that I liked very much, at the Station restaurant (it was shot at the Brasserie Julien in Paris); a beautiful scene between De Niro and the driver of the Rolls Royce who is Jewish too, but bourgeois. I also cut a scene in 1930 where the garbage truck that we see at the end of the film is stopped in front of the house, another where a crane dredges the river, leading us back to 1968. And again a beautiful scene with Louise Fletcher, who played the director of the cemetery - with one cut, we no longer see her in the film. Many of the cuts I was forced to make concern Noodles' relationships with women. 1. Leone originally cut the love scene between young Noodles and Deborah where she takes him into the back room of Gelly's and recites her Song of Songs. Sergio later added this back into the movie increasing the duration to 227/229 minutes. "...a love scene with Deborah as a young girl, a passage that I liked very much; at the Station restaurant (it was shot at the Brasserie Julien in Paris)..."
Cahiers: The film is advertised in the press book as Dolby stereo, gold, in the room where we saw the movie, which has Dolby equipment, it was in mono. Leone: Indeed, this was planned for the film but ultimately it has not been mixed in Dolby Stereo, it was unnecessary for an intimate film like this. In Diego Gabbuti’s book C’era Una Volta In America it describes Leone’s telephone conversations with Alan Ladd Jnr. as brash & bordering on the disrespectful. Leone should have travelled to LA, met with Ladd and fought for his film. Arnon Milchan admitted that he wasn’t experienced enough & that he should have released the film (uncut) later in the year (84) at a few selected cinemas in key US cities - to create buzz & build up word of mouth - the reviews from the US critics at Cannes earlier that year had already been amazing. Leone as director should also have been present at the US test screenings - Milchan/Ladd Co conducted the test screenings (evening) and omitted to tell the test audience that the film was a 3+hour movie until they were in the cinema! De Niro as the star could probably have done more he was present at the 2 (cast) test screenings the Ladd company screened in LA (cut & uncut versions) the uncut version was agreed to have been the best - so why did they release the cut version? Ladd was nervous as Blade Runner & The Right Stuff had already flopped. Yes he sued Milchan for the cut US version but he lost. Arnon Milchan admitted that he wasn’t experienced enough & that he should have released the film (uncut) later in the year (84) at a few selected cinemas in key US cities - to create buzz & build up word of mouth - the reviews from the US critics at Cannes earlier that year had already been amazing. Something like this happened anyway, because in late 84 or early 85 I saw the Euro cut at The Biograph in Chicago (appropriately, as this is the cinema outside which Dillinger was shot). I don't know how many other cities showed it, but it was available for bookings, apparently. with (one of) them naming it their favourite movie of the year.